This article has been flagged since July 2010. In the April 2005 issue of Electronic Gaming Monthly, EGM decided to pull an April Fools' Day joke. They ran a small article stating that you get a new version of The Wind Waker when you reserved a copy of Twilight Princess. This new version was supposed to be totally remade with the same graphics engine as Twilight Princess. This was, of course, a fake article, in which the picture was created using Photoshop. This is made obvious by the crucial details that are missing from the image. The next issue included a few letters from angry readers along with a confused reader the following month. There are many stories online about people who believed it. However, there were a few Zelda fans who did not fall for the hoax, and posted about it on online Zelda forums. Many of the new members fell for it, and many didn't. However, one link posted in the chat, and everybody there (namely Sear, Capn, Jason, and a few others) immediately knew it was false due to the disproportionate sizes of objects and characters in the picture, as well as "realistic Link's" tiny feet that looked exactly like "cel-shaded Link's" feet. The revelation was quickly posted on the Zelda Universe home page thereafter. The "Link's Awakening Advance" logo. 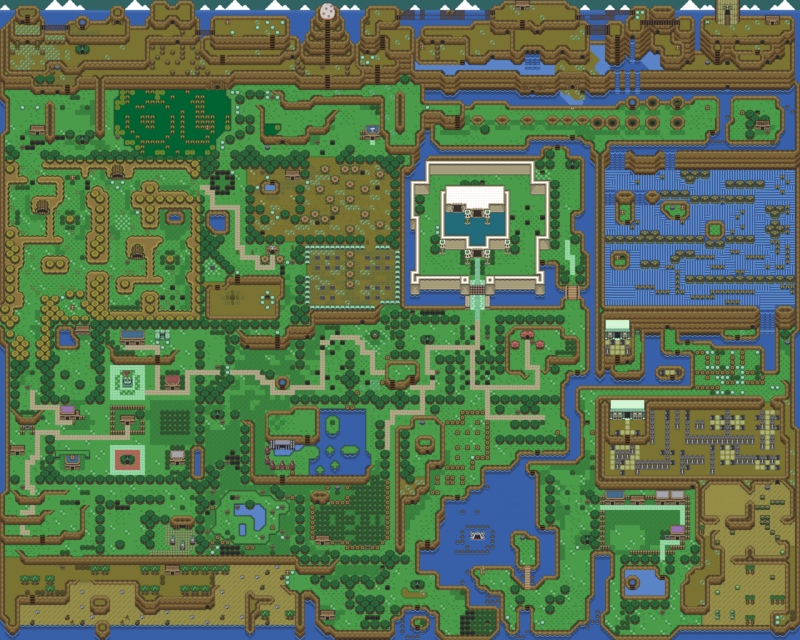 In April 2005, JonLeung and Osrevad of VGMaps.com mapped Link's Awakening using sprites from later games in The Legend of Zelda series. The map showed Koholint Island in its entirety, and was completely redone. They also created a game logo, which can be seen to the right. A "screenshot" from the Tingle game. On April 1st, 2006, the now-closed B.U.G. Gamer posted a fake screenshot (seen to the left) of Tingle (now known to be a screenshot from Super Smash Bros. Brawl in the stage Final Destination) in what appeared to be a new Nintendo game. This was in response to the rumors that a Tingle game was in the works, which was later revealed to be Freshly-Picked Tingle's Rosy Rupeeland. The image quickly created a stir in the community, until it was publicly called a fake by more advanced image editors. The image was created by then webmasters Alter and MasterWarlord. This event happened shortly before the site was permanently closed. In early 2008, a screenshot was supposedly released from Nintendo depicting a new Zelda game set in a "Steampunk" world. The game was titled Valley of the Flood, and was also known as "Project Deluge". Many fans bought into this rumor, and even after it had largely dissipated in the Zelda community, the image still traveled around the internet for quite some time. Overall, it sparked a lot of interest, as people also continued to discuss whether a game such as this would ever be released. The real source of the image can be found at deviantART, posted on 2004. Its author claims that the picture is "based on the world and characters created by China Mieville for his book Perdido Street Station". On April 1, 2008, IGN released a fake video trailer that they claimed to be for an upcoming The Legend of Zelda movie. They created it alongside Rainfall Films during the year of 2007. The video was very well put together and had very good quality, which led many Zelda fans to believe that a movie actually was being made. On April 2, 2008, IGN announced that the trailer was part of an elaborate April Fools' Day prank. This announcement upset many Zelda fans who had fallen for the prank. A screenshot from "The Legend of Zelda: Oracle of Hours". In April 2008, Jon Leung of VGMaps.com decided to once again create an elaborate hoax, one that was even larger than the last. He mapped out and designed the third Zelda game in Oracle of Seasons and Oracle of Ages, which he dubbed the "Oracle of Hours". Oracle of Hours was the fan-given title which often refers to the unreleased game, The Legend of Zelda: Mystical Seed of Courage. The maps were extensive, and covered the entire Overworld map, for both day and night. There were also detailed maps of the numerous Dungeons, as well. This was later revealed to be an elaborate April Fool's day prank, and can be found in the archives. Artwork from "Letters from the Past". "Today Nintendo surprised us all again by announcing the long-awaited Zelda for the Nintendo Wii. "Letters from the Past" is the next installment of the Zelda series and will integrate with Spirit Tracks. According to Nintendo, the only way to save Hyrule is to deliver top secret letters into the future so that future citizens can use this information within to protect themselves. 'Past Link' will send letters into the future for 'future Link' to deliver. This explains the train in Spirit Tracks. Without it, there would not be enough time to deliver the letters. This is why past Link must depend on future Link. Nintendo hinted today that there may be a little romance involved as well. Perhaps Link is going to deliver a love letter? More details to come." Well, it sounds as though we finally have some news regarding the new Zelda Wii game! Still no title announced, but it appears as though there may be an all-new hero, as well as massive warfare going. Watch the official Nintendo video below! As you can see, it looks like it’ll be one great Zelda game! We at Zelda in my Pocket are really looking forward to it! It seems as though it will be released towards the end of 2010, just in time for the holidays. On a side note, did you notice the Master Sword that’s stuck in the battlefield ground, as well as what appears to be Princess Zelda crying when she sees it? Perhaps Link perished in battle, leading to the new hero that takes a stand in this epic adventure. On April 1, 2011, a detailed and rather lengthy article, entitled Analyzing the New Skyward Sword Trailer, was written at Zelda Dungeon. The article described a supposed new Skyward Sword trailer. Among other things, the article stated the return of several famous characters of The Legend of Zelda series in Skyward Sword, including Sheik, Tingle, and Skull Kid. A link at the end of the article supposedly lead to a video of the new trailer, but actually linked to an unrelated YouTube video called Angle Dance, thus revealing the prank that the supposed trailer and the contents of the article were entirely fictitious. The article was written by a user named Locke, who had previously written an article analyzing the Skyward Sword GDC trailer, the latest legitimate trailer of the game. ↑ "In 2007, Rainfall Films worked with IGN Entertainment to produce a ficticious teaser trailer of a film based on the hit videogame franchise The Legend of Zelda." — The Legend of Zelda April Fools' Trailer, Rainfall Film's Official Site. ↑ "The new trailer gives us a lot of insight into what the story of Skyward Sword will be. It confirms Zelda, the Skull Kid, and even Tingle as characters who will be in the game." — Analyzing the New Skyward Sword Trailer, Zelda Dungeon. ↑ "Because of this, I am now certain this character is Sheik." — Analyzing the New Skyward Sword Trailer, Zelda Dungeon.